The 255-700 ETgage is a modified atmometer and is a convenient, practical tool for irrigation management. It provides the irrigation technician with evapotranspiration (ET) information which can be used to accurately estimate how much water to apply and when to schedule irrigation. Photo shows the 230-700E Electronic ETgage. The 255-700 ETgage is a modified atmometer and is a convenient, practical tool for irrigation management. It provides the irrigation technician with evapotranspiration (ET) information which can be used to accurately estimate how much water to apply and when to schedule an irrigation. The ETgage has been used successfully in the turf/golf course industries, field crops/vegetable enterprises, and tree/vineyard cropping systems. In addition, it has been utilized by a number of private and extension-type projects involving ornamental horticultural types of plantings. It suitable for use both outdoors and in indoor growing environments such as greenhouses and hotel terrariums. The 255-700 ETgage evaporates distilled water through a ceramic (clay) plate which is covered by a green fabric. This is a physical model of the reference evapotranspiration process from a well irrigated plant canopy such as turf grass or alfalfa. The fabric covering creates a diffusion barrier or resistance which controls the evaporation rate, similar to that found in healthy leaves in a well watered plant community. The ETgage is less complicated than using sophisticated electronic hardware for measuring the various environmental variables necessary for determining ET. Evapotranspiration is directly determined by visually reading a sight-tube which is mounted on the side of a water reservoir cylinder. Cumbersome empirical equations and calculators are not required. The 255-700E is the electronic version of the visual gauge. 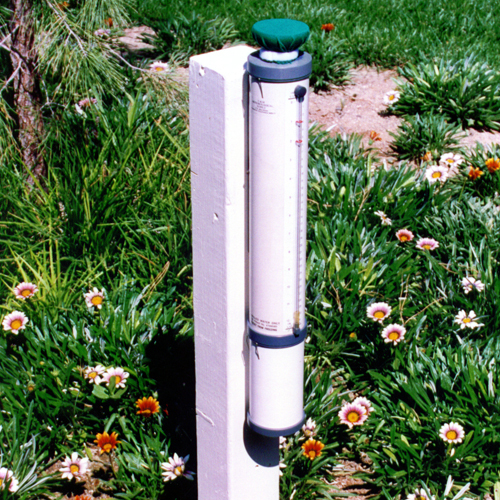 It can be a cost-effective alternative to a complete weather station for estimating ET. All of the weather variables (temperature, relative humidity, net radiation, and wind speed) act upon water evaporating through the ceramic/cloth cover interface, producing an electronic signal (pulse) after 0.01" ET has been lost. 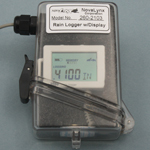 This output can be counted and logged using the 260-2103 Rain Logger, the WS-25 Weather Station, or converted to 0-5V or 4-20mA using the 135-102 Digital to Analog Conversion PCB. Using Modified Atmometers (ETgage) for Irrigation Management - This guide from the University of Nebraska describes the atmometer (evapotranspiration gage) and explains how it can be used for irrigation scheduling. Examples are provided to show how information collected with an atmometer can be used to estimate crop water use for corn and soybeans.